Note: This is Page 3 of my Back To School English Teaching Resources section. If you haven't visited Page 1 and Page 2 yet, click on one of the underlined links below. 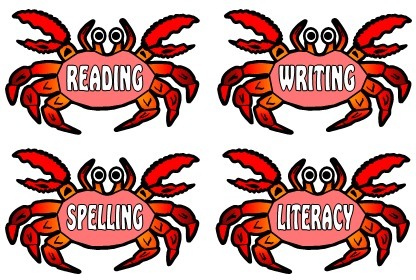 This five page banner is included for free in this set of Back to School English teaching resources. 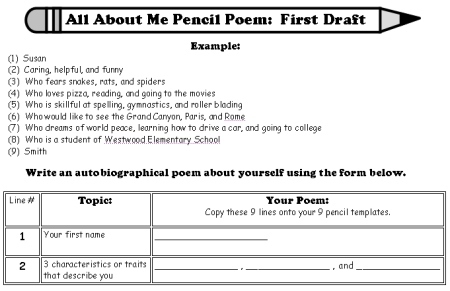 This All About Me poetry lesson plans set will provide you with all of the teaching resources that you need for your students to write an introductory biography poem about themselves for a fun Back to School activity. There are a lot of different versions of biographical poems that teachers have developed over the years. 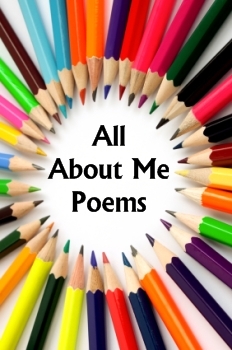 I never found one that used fun writing templates, so I created my own version of this popular All About Me poetry idea. My All About Me Poem lesson plans contain first draft printable worksheets that will assist and guide your students in writing the 9 lines of this biography poem. 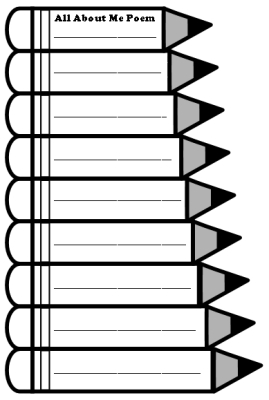 For the final draft of these biographical poems, students write the 9 lines of their poems inside 9 pencil templates, with each pencil increasing in width. After your students have colored their pencil templates, you will have a dynamic and colorful poetry display to post on your bulletin board at the beginning of a new school year. Although I have included these lesson plans on my Back to School English teaching resources page, this creative writing set can easily be used anytime of the school year. This pencil shaped poetry set contains three templates that assemble into 9 horizontal pencils. The finished All About Me Poem project measures 10 inches in width and 15 inches in height. 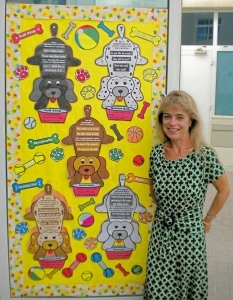 These finished projects will make a colorful bulletin board display of your students' work. 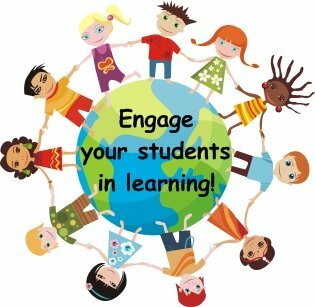 Everything that you need to complete these projects is included in this set of teaching resources. All that you will need is scissors, glue, tape, and coloring pencils. There are 9 lines of poetry for this biography poem assignment. This All About Me biography poetry set includes two first draft worksheets. 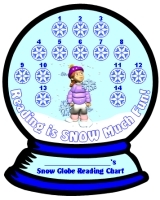 There is an example poem for students to use as a reference at the top of the first worksheet. Below are examples of the first draft writing worksheets. Students should proofread and edit their first drafts before they begin writing on their final draft pencil templates. After students have edited their first drafts, you should give them their final draft poetry templates. 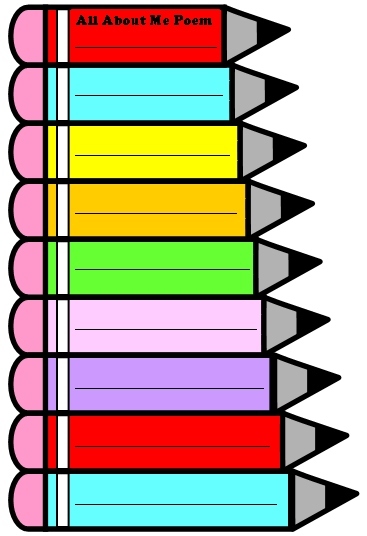 Students can color their pencil templates after they have finished writing their poems. Below is an example of the 3 final draft pencil writing templates. and 15 inches in height after they have been assembled together. 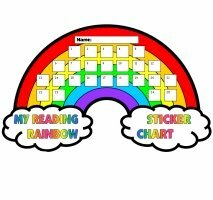 This set of teaching resources also includes color pencil templates. 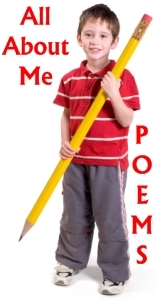 decorate your bulletin board display of your students All About Me poems. 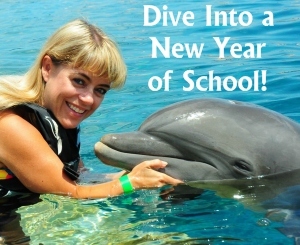 During the summer of 2011, I had the opportunity to go swimming with dolphins (that's me on the right). 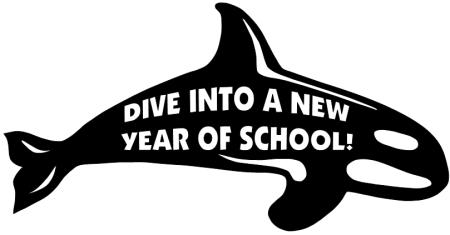 This amazing experience inspired me to create a new set of teaching resources that included Back to School and ocean themed resources together. 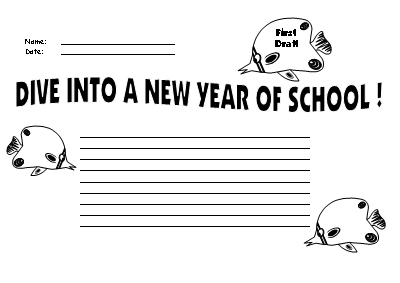 These unique butterfly fish creative writing templates measure 10 inches x 6.5 inches. 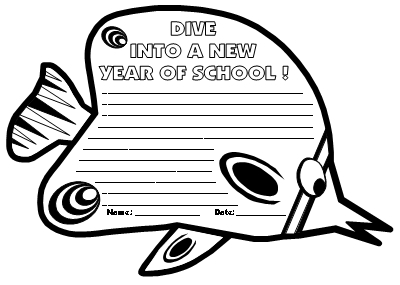 The fish templates have thick black borders so it is easy for your students to cut out their fish creative writing templates on their own. 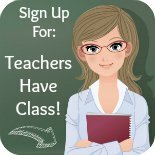 I have not chosen a topic for this writing assignment so that these writing templates can be used for any topic that you choose. 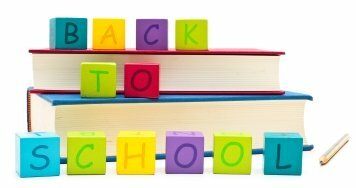 If you are looking for ideas for writing prompts, you will find many ideas on my Back to School writing prompts and September writing prompts pages. students dive into writing at the beginning of the school year! These angel fish sticker charts measure 9 inches x 6 inches. 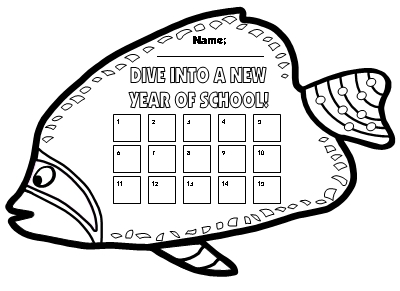 The fish templates have thick black borders so they are easy for your students to cut out on their own. 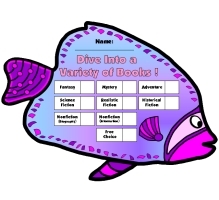 You can choose to use these unique fish sticker charts to record homework, the number of books that your students have read, or they can be used for a variety of different purposes. 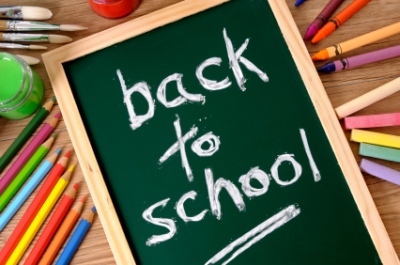 dive into good work habits at the beginning of the school year! 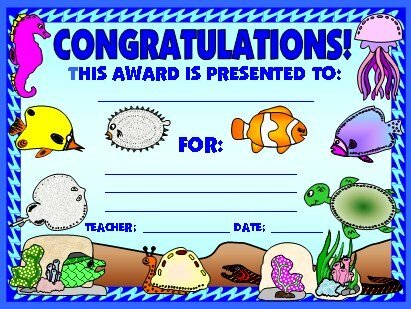 You can present this award certificate to your students after they have completed their angel fish sticker charts, or for any other occasion. 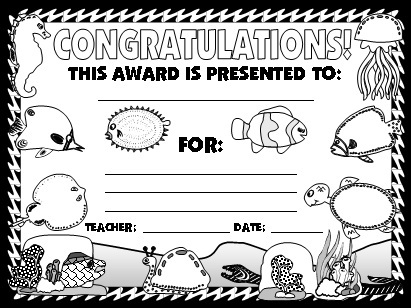 This set of Back to School English teaching resources includes color and black and white versions of this award certificate. 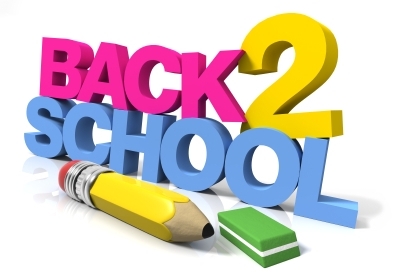 positively reinforce your students at the beginning of the school year. 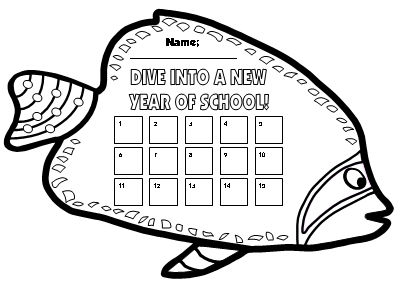 This set of teaching resources includes a large whale that measures 18 inches x 10 inches when the 3 template pages have been assembled and glued together. 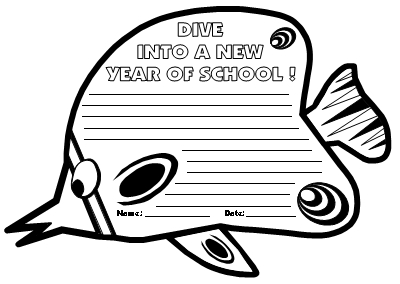 This bulletin board display set of colorful fish templates highlights the different subjects in school. 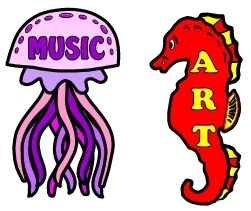 There are 9 fish that have the following school subjects written on them: English, math, social studies, science, physical education, library, music, art, and computer. 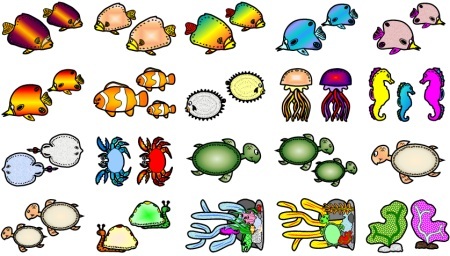 In addition, there are another 30 fish templates and worksheets included in this set of Back to School English teaching resources. 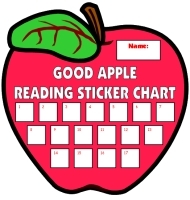 to decorate your classroom at the beginning of this new school year. 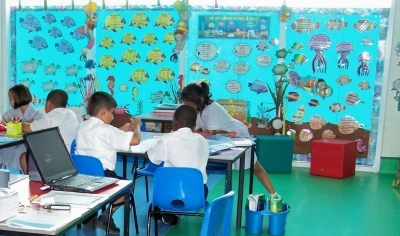 This 5 page banner is included in this set of Back to School English teaching resources. 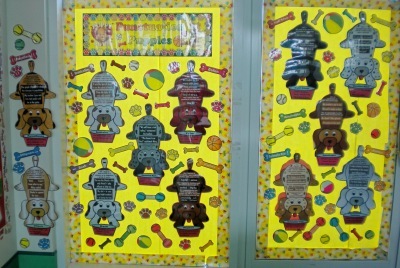 Above: My classroom Punctuation Puppies display. Above: At the door of my classroom. Click here to go to Grammar Bulletin Board Displays page. classroom bulletin board display set in more detail. 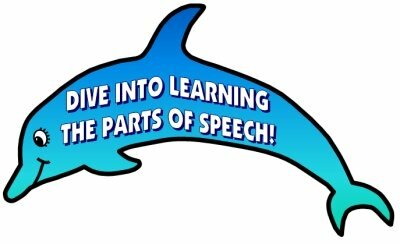 Above: My classroom Dive Into Learning the 8 Parts of Speech display. 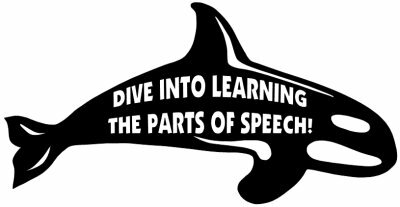 Click here to go to Parts of Speech Displays page. 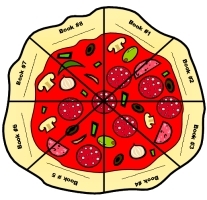 This 2nd pizza chart is exactly the same as the one on the left, except that it is a general reading incentive chart. This pizza chart encourages students to read 8 different books, instead of 8 different genres. 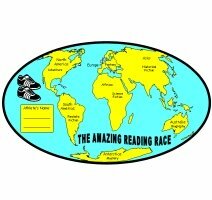 It will help your students to read with pizzazz and become enthusiastic about reading! 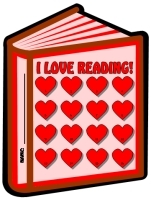 Thank you for visiting my Back To School English Teaching Resources page 3.
found on my website, click on one of the links below.